I understand the feeling some of you are having over my currently flowerbed-less back yard I mentioned in my recent hydrangea pruning post. My current feeling is the decision is only temporary. I’ll eventually be searching for low maintenance options to help soften the corners a little. Right now I’m enjoying the wide open spaces, giving me more time to rework the front yard flower beds instead. You heard that right… I am not removing anything in the front, but rather, enhancing! Welcome to my spring loaded front yard! This little garden corner resides along the driveway right before you reach the front door. And do I ever love the burst of happy colour this time of year… for free! Since I had just finished weeding the flowerbeds (go me! ), I felt you’d appreciate a little tour before all that glorious colour disappears. And hear about some changes I’d like to make as well. During spring, the little white flowers called snowdrops sprout up all over the place. They are a bulb planted flower that was already planted when I moved in, and have continued to multiply. I love that they take over since nothing else is going on at the time. Once they are finished blooming, I have a fair bit of green leaves to pull. However it’s well worth it. As for the pink tree, I am not certain of the name. The closest thing I could find online was called a Redbud Tree. Anyone know for sure? 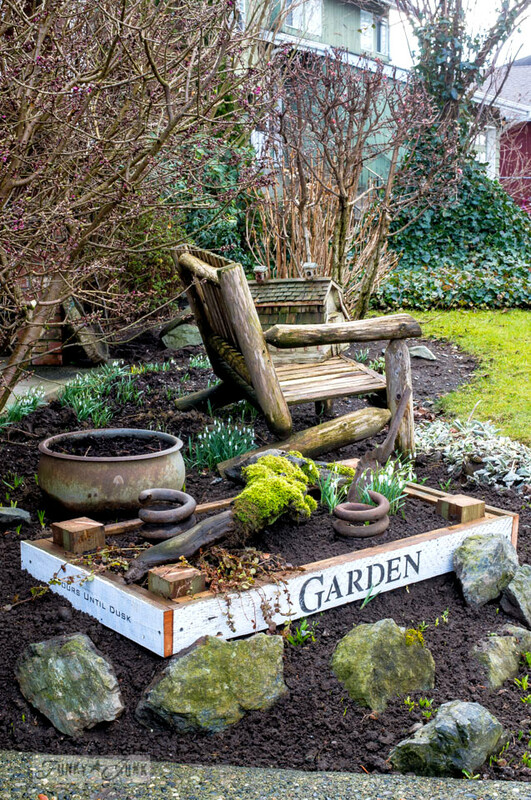 The tulip crate flowerbed was a new addition added last spring. It creates an interesting focal point that is pretty easy to maintain due to the smaller scale. 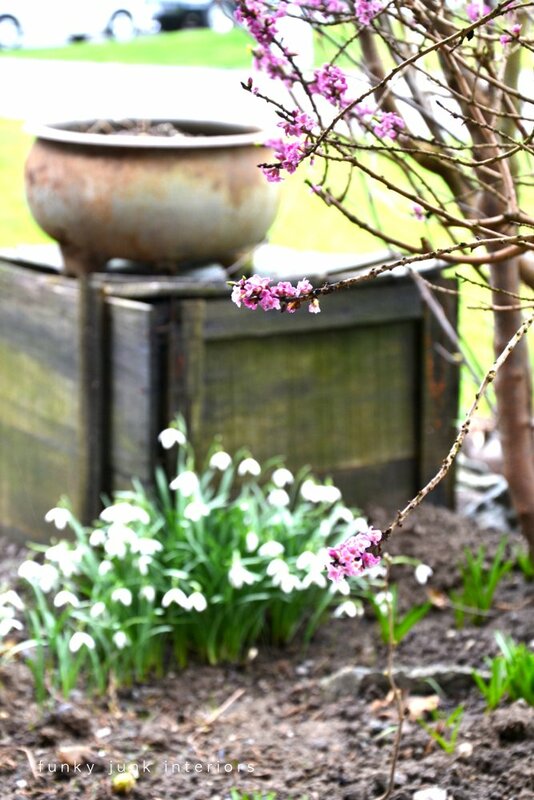 I’m allowing it to currently go a little crazy with snowdrops until they’re a done deal. Then I think I’ll put the moss covered branch back, and perhaps add some rock garden plants that don’t require a lot of fuss. This branch is hilarious. The moss turns brown in the fall-winter, then starts to get vivid green again in the spring and throughout summer. It was a fluky thing. Just a branch I found somewhere that eventually grew moss on it due to being in the shade. If you’re a long time reader, you’ll remember Teddy with her ‘drinking stump’. Fun fact: Teddy’s gorgeous dark chocolate colour was the inspiration for the trim colour on my house. 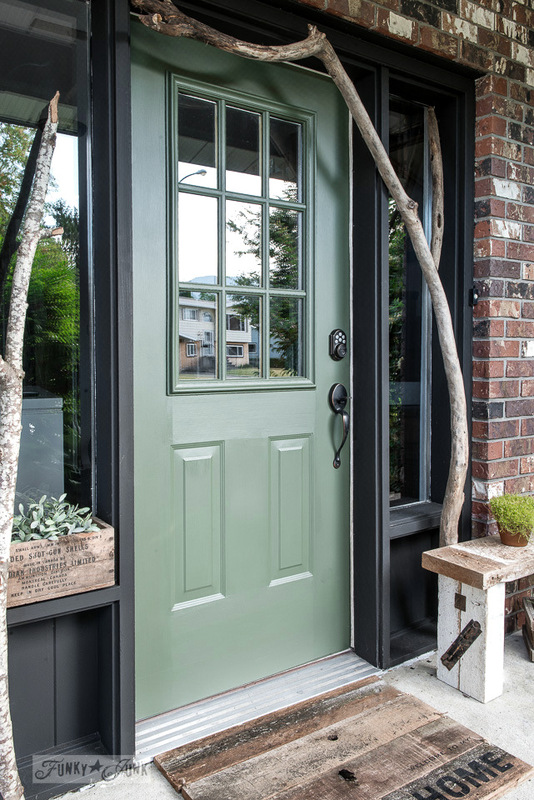 Speaking of trim… the front door still wears this gorgeous shade of Bayberry. It works so well for spring, however I’m debating on trying a new tone because it’s just that easy to swap out the colours! Give me about an hour and I’ll be done. NO idea what it may be yet… but you’ll be the 2nd to know once I do. Here is the front door when I first painted it Homestead Blue. This squiggly bush had super squiggly branches and wonderfully unique leaves… when it was alive. A local disease hit our nearby chestnut farm, spreading the effect to some varieties of trees and shrubs. This guy was hit hard. 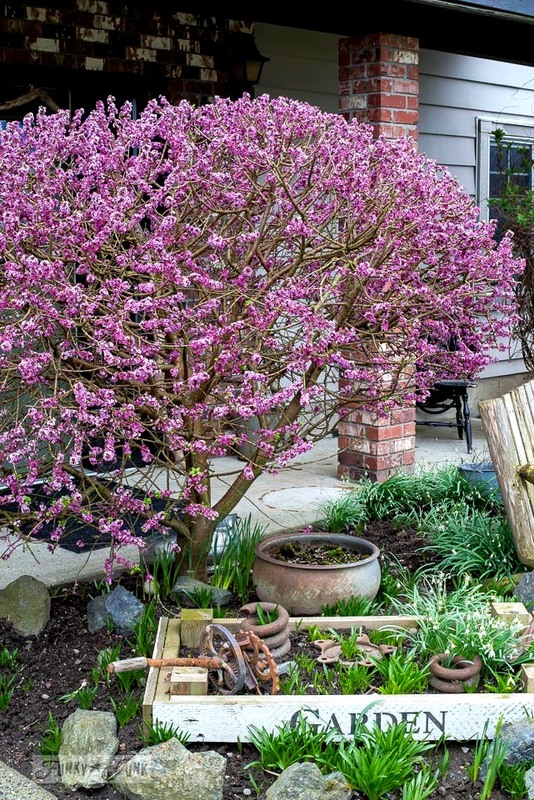 However rather than pull it out, the branches add a wonderful, natural touch and a cool way to bring some elevation into the garden! So it’s a woodsy wonder that’s there to stay. 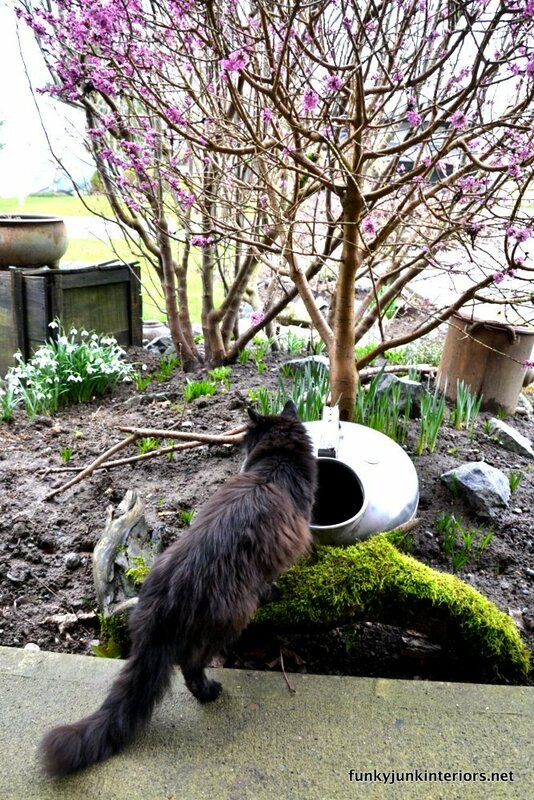 My neighbour Janette placed a bird bath on hers! I decided to google the name to see if I could figure out the name… it may be called a Harry Lauders Walking Stick according to that website. HERE is a post on how I made a toolbox handle with one if its branches. So quirky! Glad I still get to enjoy it to some extent. I am also already on Pruning Walter’s list for him to re-edge the flower beds, enlarge a few and to add new topsoil. 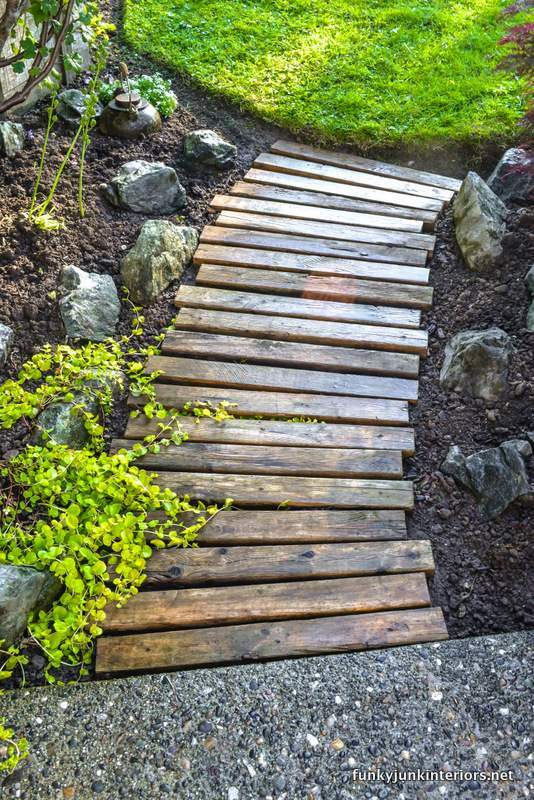 Remember my little reclaimed wood walkway? One of the most asked questions I get is, is it rotten yet? It took 5 years however I’ll be replacing it this year once the new soil arrives. Not sure what I’ll use yet but you can be sure I’ll be on the hunt for something cool and easy to implement. I’m also on a gardener’s list for getting the lawns thatched which will make mowing a lot easier. The moss is pretty thick this time of year and needs dealing with. I’m going to attempt to get the lawn back to the land of the living after ignoring it for a few years. We’ll see how that all goes. So… lots more fun to come! Anyway, it’s always such a pleasant surprise to see what spring brings on auto pilot. More time to bike ride I say…. 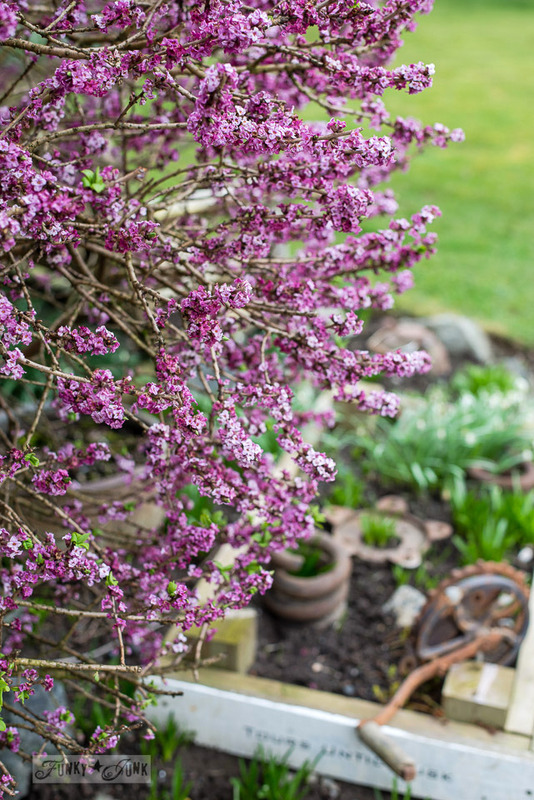 What’s currently blooming in your yard? Planning any changes as well? 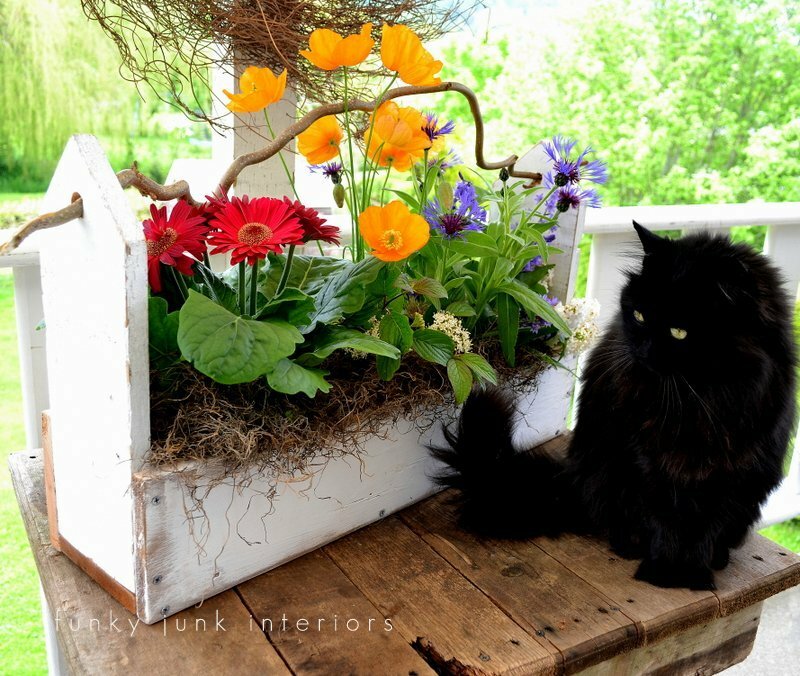 It’s gorgeous I am always on the lookout for unusual things for the garden, over the years I have collected wood like nature does they become home for live critters. I started sealing the wood applying colored Silicone to the bottom dipped it in stones. We also go to our vegetation dump for the city they have Free compost & wood chips to keep the weeds down. Wood chips… now that sounds enticing! I’d been debating on whether to use something to keep the weeds down. The way you are preserving outdoor wood sounds really intriguing Ann! I’ll give that a little more thought! 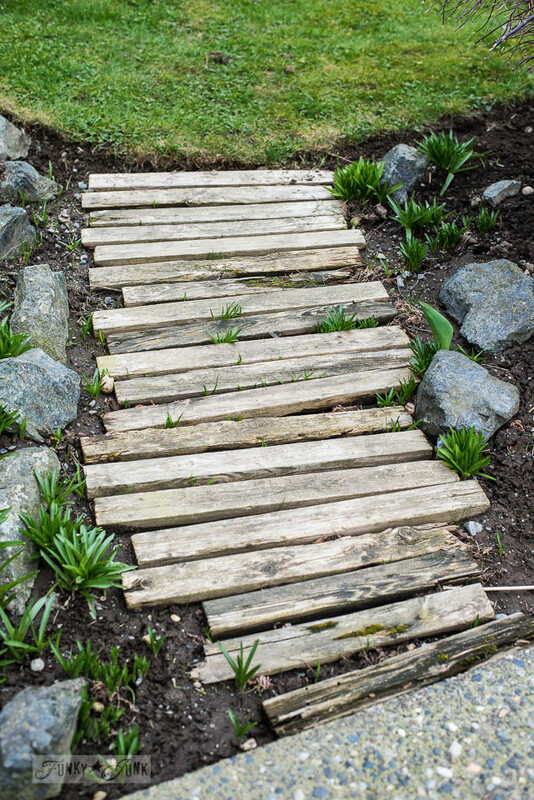 I love wood stuff outdoors but it never lasts all that long, that is for sure. Donna, I am envious. Know that’s traditionally a good thing, but I live on the east coast of the U.S. and just had a nor’easter snowstorm and nothing is blooming in my yard yet. The forsythias were starting to get some color before, but I think I will have to wait a little longer. Don’t get me wrong, I am a snow lover, but to see your colorful yard and it’s like, aaaahhhh! Glorious. When does fall and spring start in your neck of the woods? I’ve noticed over the years that you’re ahead of us. Love, love, love, the moss branch, the squigglers and odd looking bushes. I find those quirky things joyful. Thanks for sharing. Have a wonderful day. It sure was good to get your post. Aww.. it’s always nice to hear from you too, Joanne! I love hearing your musings! Our fall generally starts in mid September. We can get some pretty warm Sept though so it can be all over the map. British Columbia is Canada’s Bahamas, we have the most mild temps so our gardening generally starts earliest on the west coast. I love the snow too, but after our year of several dumps when we are accustomed to having snow for like one day, I’m over it and ready to move on to pretty blooms too! I’m starting from scratch this year so the work load has been hefty… Finally got my herbs off to a great start so I’m super excited about that. 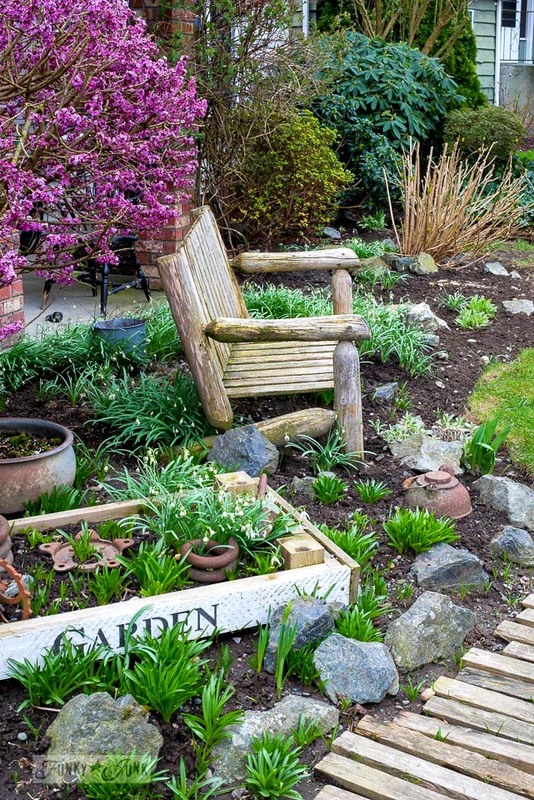 Love your planting areas because they’re interesting and the smaller raised bed looks great a year later. You might like coral drift roses – they’re so pretty and easy to care for. You can find them on my blog, they offer a great statement without all the fuss. Coral drift roses… I even love the name of them! I’ll totally look into them! Yes, I can imagine starting brand new a tad overwhelming… but also how exciting! I’ll be watching over your new creations! Oh Donna, I’m so jealous. I only have daffodil shoots coming up (about 2 inches) now. No other color yet. When I was a kid, my Mom used to “bake” stepping stones for the outside. We didn’t have a lot of money growing up, so she used old cake pans of various shapes and sizes and lined them with plastic saran type wrap. Then she would mix up a small batch of cement in an old bucket and pour it into the cake pans and then us kids could put whatever we wanted into the top part of the cement to decorate them (bits of broken China, plastic army men, unique and pretty stones). It took about 20 years for some of them to start to fall apart. I have one that I made with my son when he was little, it was from a kit. 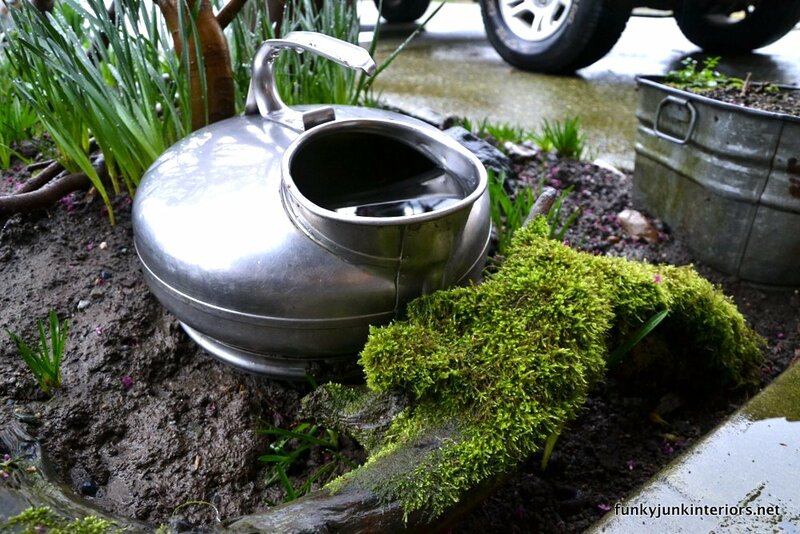 I’m getting nostalgic and I might pick up a few old cake pans at yard sales and try this again for my garden. OH MY how pretty. Reminds me of good ole Alabama in the Spring. But now I am at almost 5000 ft elevation, High Desert, Arizona. Not getting the colors yet but soon. I have a section out front that I plan on covering in perennials and some fun annuals. All have to be in some sort of pots because the ground here is like cement. No wood objects unless treated because of termites. I learned the hard way on that one. But I can’t wait to fill it and then sit and enjoy. I also can’t wait to sit out and enjoy. We aren’t quite warm enough but some days get close! I think that pinky purple plant is a daphne. I have one also and it is the first thing to bloom in the early spring. So pretty! Cool, I do believe you’re right Teri! I found a Rose Daphne online that appears to be the same. Good to put a name to it. Thanks for your help! Love your front yard and the squiggly bush. The box with rusty things in it is cool also. I am in Cali and our fruit trees are in bloom. 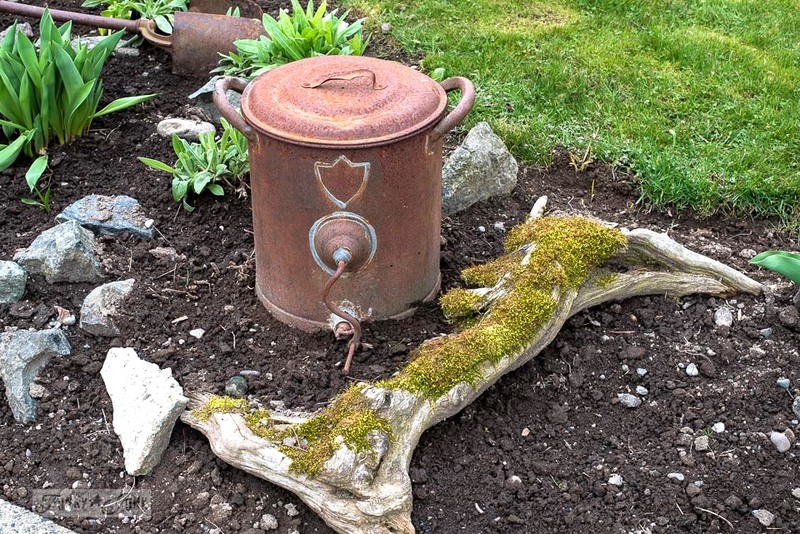 I plan on making a junk garden this summer. Old rusted things and plants. 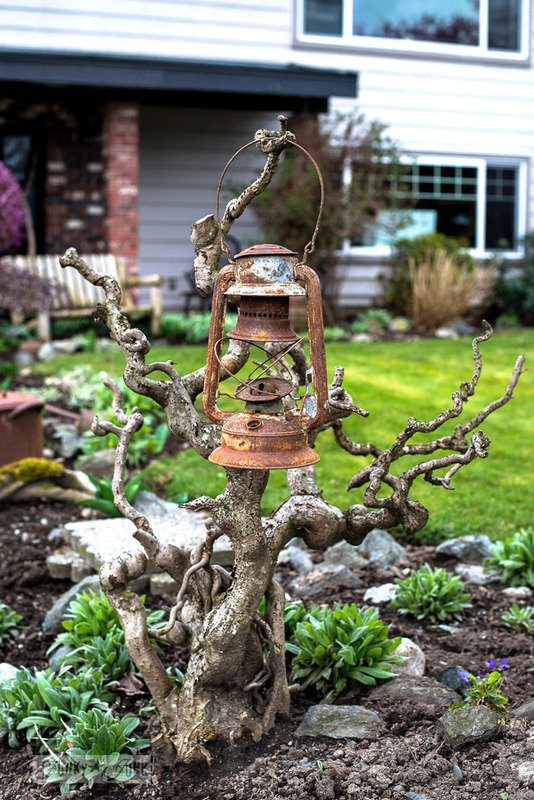 Loved it all……especially the squiggly naked bush with the wonderful rusted lantern! I love everything about your garden. 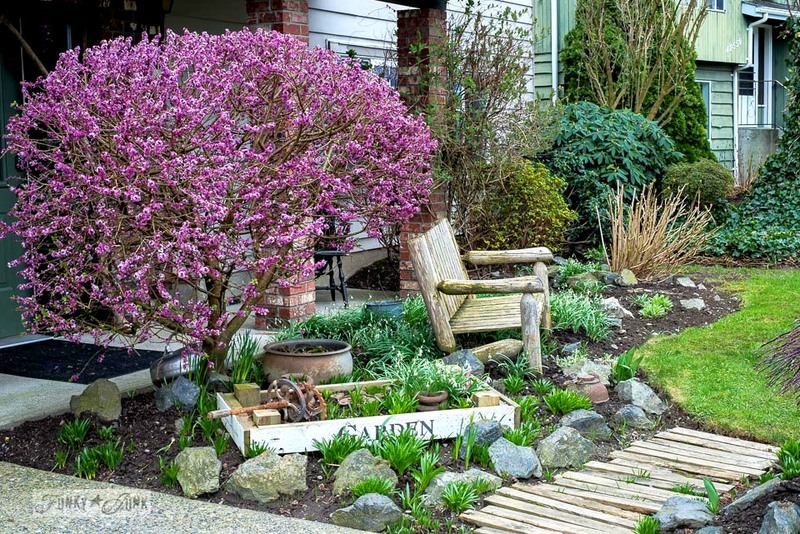 I can tell you have spent lot of time getting your garden to this fabulous point. You have taking pride in this garden, because its to beautiful. The yard looks beautiful! I wish I could get outside but here in Ohio it’s either raining or snowing or just to cold! Donna, I can’t tell you how happy I am that you’re posting gardening stuff. I thought last year you were done. Looking forward to seeing the development of your front yard. Happy gardening!